Have peace of mind that someone you trust is monitoring your website. A website is a vital part of any business. Protect the investment you make in your website. For existing WebCami Site Design clients ONLY. What would you do if your website got hacked? Would it be good for business to have a website with a "hacked" warning on Google? Would you know where to start in restoring your backup that is, if you have a backup, or even worse, restoring your database! How much money would you lose if your website went down for a few days or weeks? Just like apps and operating systems on your phone, WordPress core files, themes & plugins need to be updated. It’s important to have updates performed regularly by a professional who can monitor, scan for malware, and tackle any issues that may arise in the process. Set and forget days are over when it comes to your website. If WebCami designed your website, you are automatically eligible for client care services. If you aren't a current client of WebCami Site Design, you can become one! An assessment of your website is needed prior to sign up. Contact WebCami for more information. *New custom design/theme change clients will receive one FREE month of Basic care plan support for free to evaluate the service. The following features can be added to your Basic care plan for an additional $25 a month. Pricing is for one website. WebCami receives instant notification if your website goes down so we can address the problem before it becomes serious. Monthly reporting will reveal any chronic issues with your hosting provider. Performance checks that provide insights into website page speed. After we get a baseline report, plugins are added to boost speed and make adjustments where needed. Monthly checks to system. How do people find you? Find out with professional keyword monitoring for up to 10 keywords/phrases plus competitor reporting each month. Your Google Analytics account is connected. If you have regular design maintenance this is a chance to buy down my $95/hr rate. Pricing is for ONE website. BASIC CARE PLAN: All monthly subscriptions require automated mon thly credit card payments. Cancel at anytime. Annual payments can be credit card or check. No refunds. ADD-ONS: All add-on features require automated monthly credit card payments. No check or annual purchases available. This give you more flexibility in changing your packages in the future. If you currently pay an annual fee for your Basic care plan, that will not change. Are you interested in client care services? WebCami Site Design can’t guarantee your site will be malware and hack-free, but regular updates can significantly lessen the odds that your website will be a victim of internet hacking. 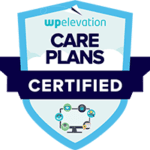 Cami MacNamara has completed training in WordPress care plan services and continues to gain experience in our ever-changing online environment. Cami has given me exceptional service in developing and supporting our web site - which is beyond cool. Better yet, she has given me great advice and made my life easier with her WordPress Care Plan. Before she was involved at that level my website was hacked and quarantined. This can turn a good day to a bad one very quickly. Since Cami has been looking after me and my website I haven't had to get involved in resolving any issues. There have still be issues as there will be in today's online environment. But she detects and corrects them BEFORE users encounter and issue - and certainly before I know it has occurred. And she's a really cool person to deal with. Always in control and honest about deadlines, helping me and my team to manage our responsibilities and keep an open mind about how our website can transform in form and purpose over time. We have learned a great deal from working with her and are grateful to be associated with her.